In a sensational development, Dr Sarabjit Singh whose badly charred body was found at his house on the Jamalpur road on Saturday and the police suspected it to be a case of suicide has now turned out to be case of murder. The postmortem report has suggested that the doctor was murdered and his body was burnt to eliminate evidence. Three constituencies, including Ludhiana East, South and Gill, have been declared super-sensitive for the Assembly elections to be held on January 30. There seems to be no end to the woes of the Congress candidate from the Ludhiana East Assembly segment, Gurmel Pehalwan. Rebel Akali councillor Simarjit Singh Bains today said that his group would be supporting another rebel Akali leader, Daljeet Singh Grewal, also a councillor, from the Ludhiana East constituency and may not field any candidate from Ludhiana West, from where Bharat Bhushan Ashu (Congress) and Rajinder Bhandari (BJP) would be contesting. Rebel Congress councillors, who have virtually opened a front against Surinder Dawar’s candidature from the Ludhiana Central constituency, met Capt Amarinder Singh, president of the Punjab Pradesh Congress Committee (PPCC), at Chandigarh today. 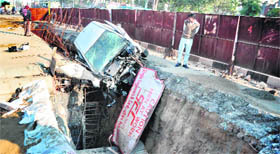 Two students of Guru Angad Dev Veterinary and Animal Sciences University (GADVASU) had a providential escape after their car fell in a trench dug up near Aggar Nagar Chowk in the wee hours of today. Due to their performance as an all-terrain vehicle and capacity to travel in urban as well as rural areas for campaign rallies during elections, the demand of sports utility vehicles (SUVs) has gone up. SUV dealers in the city are all smiles as the sale of these cars have suddenly risen during this time of the year. Under the directions of the Civil Surgeon, Dr Subhash Batta, a team of health officials today inspected a dozen meat shops in different localities of the city and also took samplesof eatables from some other shops. After a group of Congressmen from Atam Nagar constituency revolted against the candidature of Malkit Singh Birmi and gave a two-day ultimatum to the party high command for reconsidering their decision, it is learnt that a meeting, in this regard, was held today. 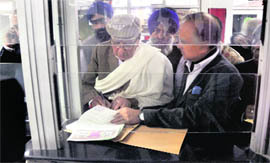 BJP candidate Satpal Gosain filed his nomination papers from the Ludhiana Central Constituency to the returning officer at the office of the GLADA here today. Gosain was accompanied by his son and grandson. Bahujan Samaj Party official candidate Navjot Singh Jarg today filed his nomination papers from Khanna (general) seat in the office of the SDM, Khanna, Inderjeet Kaur Kang. He along with some of his supporters reached the office and presented his set of papers to the SDM. Although the shawl industry might be facing a bleak season in the domestic market due to squeezed winters but internationally it is blooming and has seen an upward trend in the past few years. There seems to be no end to woes of LPG consumers in the city. They are either facing “acute” shortage of the LPG or are forced to bear the “rude” behaviour of attendants. The Institute of Allied Health Sciences, Christian Medical College, Ludhiana, held its second graduation day function today. Dr Manjit S. Kang, former Vice-Chancellor of the PAU, Ludhiana, was the chief guest. As many as 60 students graduating in the session 2009-11 were awarded diplomas in 14 allied health specialities by principal Dr AI Benjamin. The "best student" awards were presented by Kang to the students from each courses. The B.Sc Agriculture (Hons.) students of the College of Agriculture (COA), Punjab Agricultural University (PAU), visited Bhundri, Gorsian Makhan, Gurahur, Bharowal Kalan, Khudi Chak and Kot Mana villages as a part of their 10-day training course. 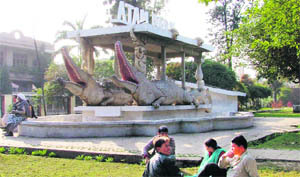 A view of Atam park in the Atam Nagar constituency, Ludhiana. Photo: Inderjeet Verma. With electioneering picking up in the region, candidates are prepared to level allegations against each other. Not just that, they are ready with the huge list of their “achievements”. The election campaign is going to hot up with only two days left for filing the nominations. The candidates contesting from different constituencies for various parties are busy meeting residents of their constituencies. And their well- wishers can be seen serving tea/coffee along with dry fruits, gachak and spicy snacks. But all this might be harmful for their health. Punjab School Education Board announced the result of class X first semester. Chairman PSEB DS Dhillon said the result has been uploaded on the department's web site. It would be displayed at 8 am on January 10. “Dogs usually develop weak immune system in winters, as they are under stress. During winters they become weak and are susceptible to infectious diseases. Precautions must be taken to avoid contact with other diseased dogs”, Dr Kirti Dua, HoD, veterinary medicine of Guru Angad Dev Veterinary and Animal Sciences University, Ludhiana, said. While the police failed to nab the thieves who targeted Max Engineering, a factory unit, in the Dhandari area and decamped with engineering goods worth Rs 5 lakh on October 29, the unit again fell prey to the thieves who, this time, decamped it with engineering goods, LCD, CCTVs' worth near Rs 2 lakh. 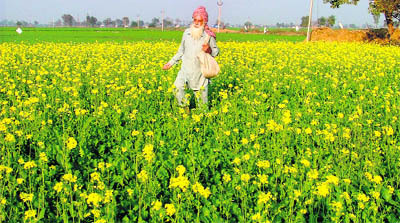 Phillaur: The Goraya Police has succeeded in solving a murder case of a migrant labourer identified as Vikas. The police has arrested two villagers namely Davinder Singh and Sukhdev Singh of Dosanjh Kalan Village under Section 302 and 34 of the IPC on the charges of murdering. The murder took place on the night of January 2.